Eric Zobel (left) and Tom Beland, both of the UCSB Department of Housing, Dining & Auxiliary Enterprises, stand before a section of the Carrillo Mural. 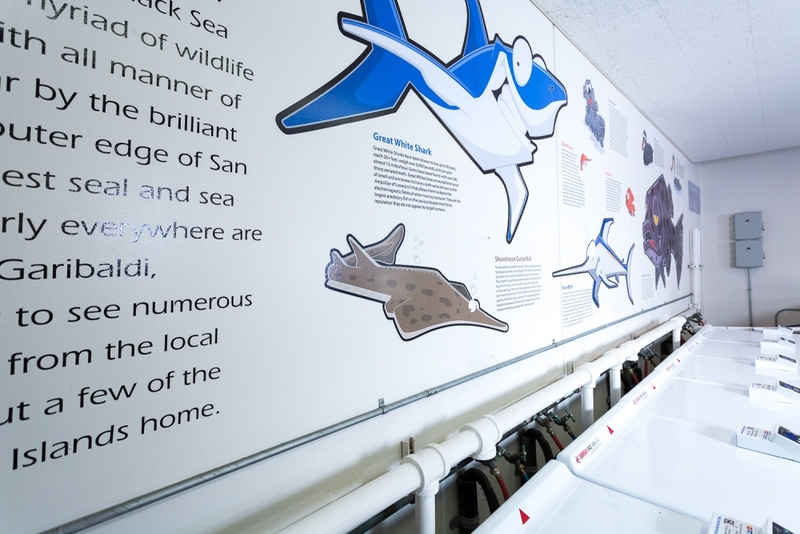 A great white shark, giant sea serpent, humpback whale, shovelnose guitarfish, elephant seal and other wildlife are on display in an unlikely place at UC Santa Barbara — the laundry room on the north side of the UCSB Carrillo Dining Commons. The marvels of nature are among 25 species featured in the Carrillo Mural, composed of Disneyesque vinyl decals with accompanying educational text. 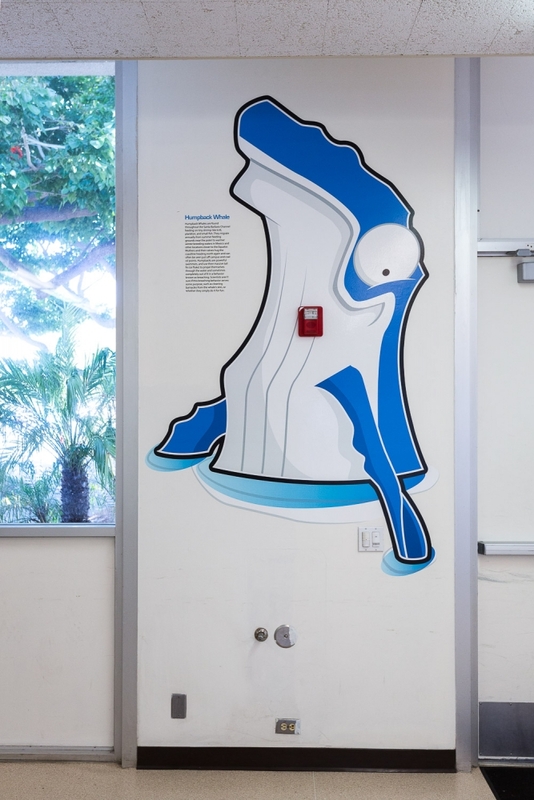 Described as a tribute to the wildlife found on and around the California Channel Islands — about 20 miles off the Santa Barbara coast — the mural also includes a sea otter, dolphin, swordfish, giant black sea bass, swell shark and Channel Islands fox. “Not many people know about it,” said Eric Zobel, a graphic artist in the UCSB Department of Housing, Dining & Auxiliary Enterprises. 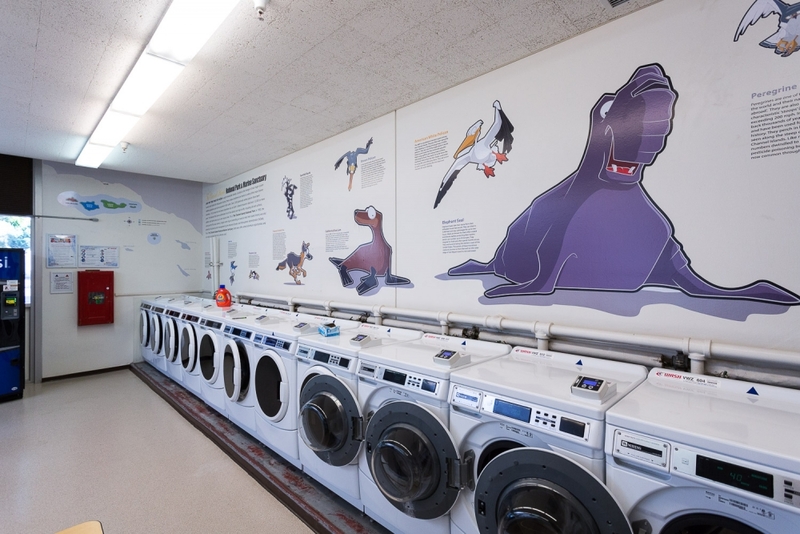 He conceived and illustrated the mural with painstaking precision that required measuring the laundry room a “million times,” angling around pipes, outlets, doors and a soda machine. 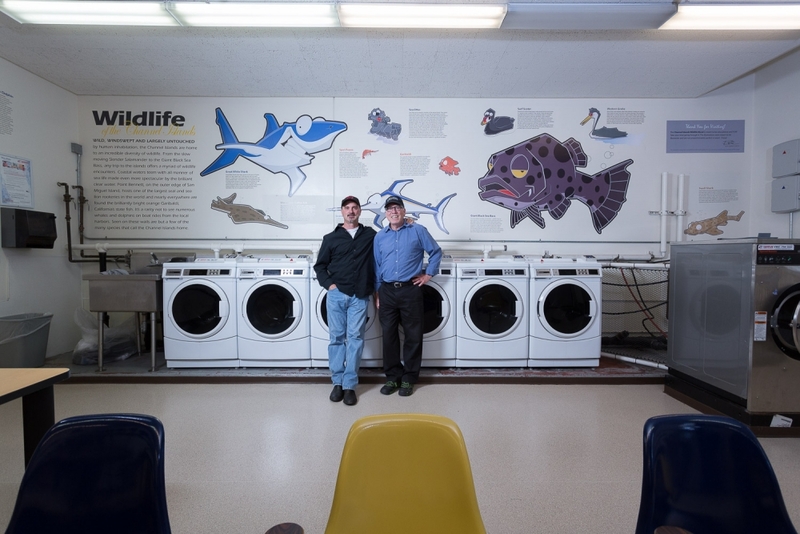 The idea to dress up the laundry room goes back to 2015 and a comment by Tom Beland, director of the Department of Housing, Dining & Auxiliary Enterprises, who determined the room would benefit from some sprucing up. He suggested an ocean motif, though he had nothing specific in mind. Beland joked that he considered buying some paintings from a discount store and hanging them on the dingy, yellow walls. “The whole room was ugly,” he said, laughing. The project ended up in Zobel’s capable hands. He zeroed in on the Channel Islands theme because several nearby residence halls are named after the islands: San Nicolas, Anacapa, San Miguel, Santa Rosa, Santa Cruz, Santa Catalina, and San Rafael. Many of the characters were chosen because they “fit” the dimensions of the room, Zobel said. He sketched the animated creatures, loaded them on his computer and then mapped out the layout. To be printed, the decal images had to be blown up to full size on Zobel’s computer. “The file sizes were huge,” he said. When it came time to install the mural, dozens of washing machines were pulled away from the wall, the room was repainted and the decals — including characters and text — were carefully rolled out on the newly painted surface like wallpaper. He planned on doing nothing with one wall where several large vent pipes run up to the ceiling. But he reconsidered when a dead oarfish, a giant sea serpent that was 18 feet long and close to 400 pounds, washed up on an area beach. Inspired by the historic find, Zobel added the character to his ensemble — not quite life-size but big — and, with the help of a worker, methodically reeled it out behind the pipes. 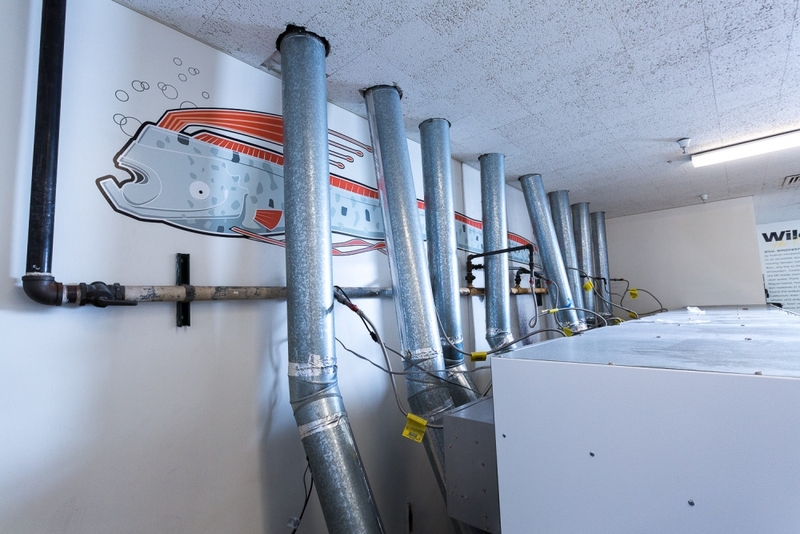 “I thought that would work perfect behind those things,” he said, referring to the vent pipes. Zobel toyed with covering the dryer ducts in green material to simulate seaweed but Beland nixed the idea because it might create a hazard.